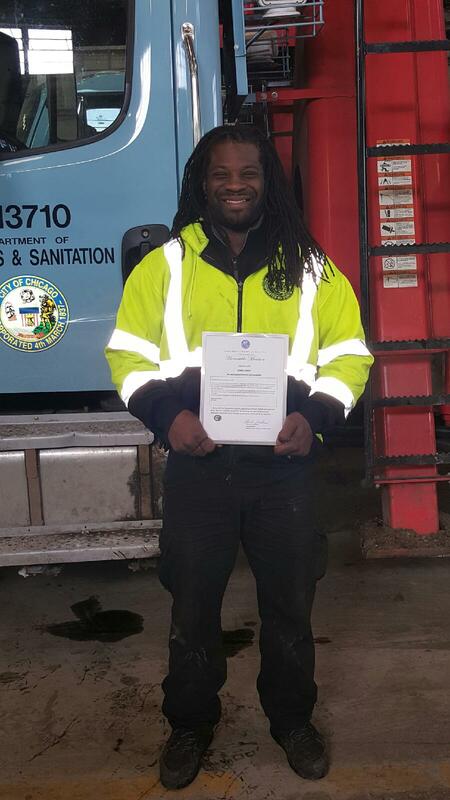 Teamsters Local 700 member Joseph Lowery was recognized by the City of Chicago’s Streets and Sanitation Department for his hard work and professionalism that he provided during a recent residential cleanup. Joseph has been a Motor Truck Driver for the city for nearly 14 years and is currently based out of the forestry location at 103rd Street. He was sent on a job earlier this year to remove backyard debris, including tree branches and stubs, for Ella White, a resident of the 8th Ward in Chicago. Williams presented Joseph with an award last month, describing him as a “shining example for all” and applauded him for his hard work and dedication to the community.